After you have your new website up and running, the next step is to monetize it. After all, the big idea is to turn the witty words from your blog posts into the dream of becoming a ‘Dotcom millionaire,’ and you can then retire to a secluded beach, with the money continuously flowing into your bank account. While a few folks hit it big online, the reality is to not quit your day job, as it is challenging to earn money online. The first key is to have compelling content, that keeps those eyeballs coming back to visit your site, as opposed to the over a billion other websites out there. Once you have consistent traffic, the next step is to configure the revenue stream, and that is where affiliate marketing comes in. 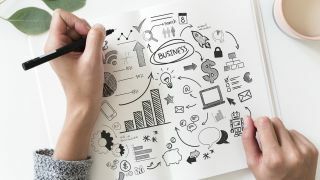 Basically, you partner your website with the affiliate marketing program, that in turn connects you to a merchant that sells your product. For example, you write a post about the uses of a widget, and the affiliate marketer then connects you to a seller that has widgets available for sale, and in turn a cut of the profits comes back to you when a reader purchases one. Simple, right? With that brief backgrounder in affiliate marketing out of the way, let’s go through some great, and potentially profitable, choices to partner your website with, while highlighting the potential pitfalls. Clickbank is a major affiliate marketer which has been around for years, with 200 million customers. They feature a variety of products to partner with, across many categories, particularly eBooks. It is simple for a novice to get started as anyone can create an online account, and it is free with no signup fee, so it is great for startups. They are also notable as Clickbank is known for having a higher commission rate than other affiliate marketers. They even run a Clickbank University to teach the ins and outs of affiliate marketing to those new to the field. The downside of Clickbank is most of the products for sale are eBooks, and while they span several categories, most are lower quality offerings, without name brand recognition. The drawbacks of ShareASale center around the payouts. The payout threshold of $50 can be difficult to reach for newer websites still building their traffic. In addition, to add insult to injury for a struggling site, they can actually delete your account if your account remains under $25. JVZoo is relative newcomer with six years of experience, and takes a SaaS approach to affiliate marketing; they must be doing something right as they were named by Inc among the ‘5000 Fastest Growing Companies in America’ for 2016 and 2017. Product creators can list their products in their marketplace for free, and JVZoo gets a standard 5% commission on anything that sells - and nothing before that. Marketing affiliates get instant payments to their PayPal accounts as soon as the item sells, with no payout threshold required. In addition, there is opportunity to make money as affiliates can get a cut of sales of any affiliates that they have recruited, termed a ‘Second Tier Commission.’ Finally, if the buyer that was referred purchases another product (that was not specifically referred), the affiliate gets the commission- permanently. The downsides include that payments are only made via the PayPal platform, with no option for direct bank transfers. Also, looking at the top selling products, they are all digital downloads, and of lower quality, that could potentially lower the quality of a website. Finally, the affiliate marketing commissions will be taken back for a buyer that requests a refund. CJ Affiliate is a popular affiliate marketing program with global reach, formerly known as Commission Junction which goes back to 1998. CJ Affiliate features Product Widgets that are embedded on your site, and can then feature multiple products via a slideshow, collage or grid to increase sales. Additional functionality includes deep link automation to automatically monetize links that lead to a CJ advertiser domain, and real time transaction monitoring. While this all sounds good, the stumbling block is the application process. First you need to apply with your website, which needs to be found worthy of becoming a partner, based on traffic, optimization and quality of content. However, this is only the first step, as then you need to apply individually to each vendor for the products that you wish to sell, and you may not be accepted into their individual affiliate programs, making this one of the harder programs to get up and running with. Just about everyone already has an Amazon account and buys stuff from them, so it certainly makes a ton of sense to partner with them as an affiliate marketer in their Amazon Associates program. They also sell, well, just about everything, so you can be sure that they have a product to market that is relevant to the content on your website. It is also free to join, and once accepted to the program you can sell any Amazon product, including third party ones without getting into individual programs. You also get the opportunity to get commissions on not only the specific product that was advertised, but any other purchases that are made at Amazon for 24 hours post referral. A policy change in March 2017 has frustrated many users, as the commission rate is as high as 10%, but most categories are less, in fact quite a bit so. For example, the commission rate on video games is only 1%, and on televisions it is a low 2%, making it difficult to generate larger profits. Awin is a huge affiliate marketing platform that boasts of over 13,000 advertisers, 110,000 active publishers, and generated 148 million sales in 2017. Publishers can sort through different advertisers to apply for the products or services that might work best, then if accepted, apply targeted links to generate sales. Despite the size of the platform it's actually quite easy to use. Tradedoubler is another big advertiser, especially in European markets. Like with CJ Affiliate and Awin you need to apply to different advertisers to be accepted, once that happens it's easy to get started. You can use simple links, or any of the promotional banners provided. eBay partner program is specific to the eBay platform, a huge online marketplace populated by many small sellers. The advantage here is that you can list eBay products and be paid for any link clickthroughs that result in sales, without having to actually market any products directly through eBay itself. Google Adsense may be seen less of an affiliate program as much as an advertising solution. However, if you're looking to monetize your website you should probably look to Google Adsense as one of, if not the main, source of income for those pages. While the payout isn't high it does add up, and can help support your affiliate marketing campaign and revenue. Skimlinks is a program that replaces keywords in your text with paid-for links, from which you get paid per click. The advantage is that the links work directly in your copy so you don't need to make room for adverts, but the disadvantage is that some malware can do something similar, so Skimlinks might not look the best for your users. However, it's another option to consider on topic of your affiliate marketing and Adsense to help provide an additional revenue stream.